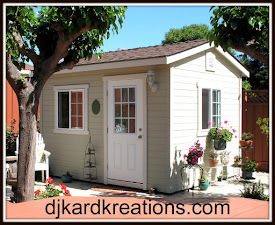 Today I'm joining in the Watercolor Hop being hosted by Paulina on her Pretty Pink Posh website. There are pro watercolor card artists appearing as guests (which means oodles of inspiration) and lots of prizes being offered. The hop runs from June 5-8, 2015. I hope to see you there! The stamp is from Impression Obsession (E2295). I watercolored it with Distress Inks by smooshing the sunset-colored ink pads onto my acrylic block and painting with my water brush. These colors were chosen because of a phrase we often use around here, which we first heard spoken by a gas station attendant while we were on a camping vacation thirty years ago. "Yes, sir," he said to the Mister, "when the hills are pink, it's time for a drink." The sediment is from Imaginations. The border was made by die-cutting a Simon Says Stamp "Grid Border" and using it as a stencil to watercolor inside the boxes. 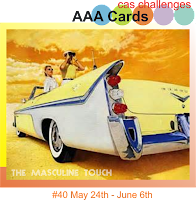 AAA Cards: For the Guys. 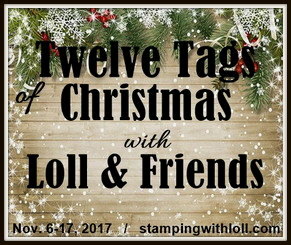 Sweet 'n Sassy Stamps: Let's Here It for the Boys Blog Hop. The roses are from a v.o. and long-neglected SU stamp. I first applied Distress Ink markers directly to the stamp and then I spritzed and stamped it onto watercolor paper. I added more color and detail by scribbling Distress Ink markers onto my craft mat and using a water brush. 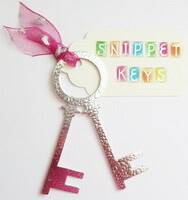 The stitched dies are from Lil' Inkers. To give the card dimension, I inked all around the sides of the inner panel with my Versafine black ink pad before placing it back inside the frame. After holding my breath for that risky maneuver, I wasn't taking any more changes, so I used a pretty SRM sticker for my sediment. Addicted to Stamps and More: Use Your Mark. All the links provided will take you to the challenges where you will find details on rules, sponsors, prizes and lots of inspiration! Darnell, I love the fun image in the dad's day card and you colored it so well. But whoah, you knocked me out with your gorgeous floral! Absolutely beautiful! Darnell, I love this rose card. Watercolor is my favorite art technique. Stitched frames I really like so I'm totally loving this card. Good Job! Sylvia D.
Well, they are both GREAT watercolour cards Darnell . . . but I am plumping for the Dad's day one as my fave. Absolutely gorgeous cards!! Your roses are splendid!! What a fabulous pair of cards Darnell! They are so different but I wouldn't like to have to choose one as a favourite. No crafting under the influence now my friend!!! Wow those beautiful water color cards just keep coming...they are awesome!You make it look so easy! 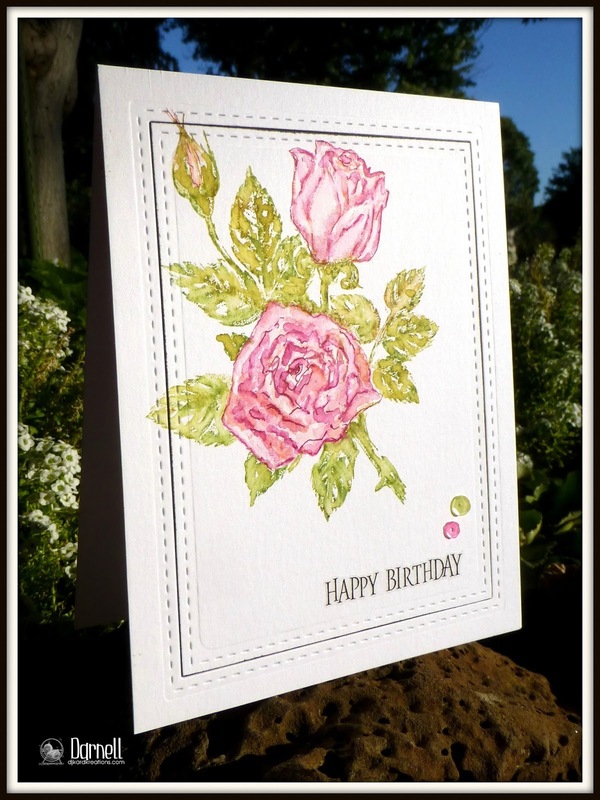 Love the phrase about the pink hills, how you used the grid die as a stencil and watercolored it, and that beautifully colored rose on the second card! So fabulous, both of the cards! 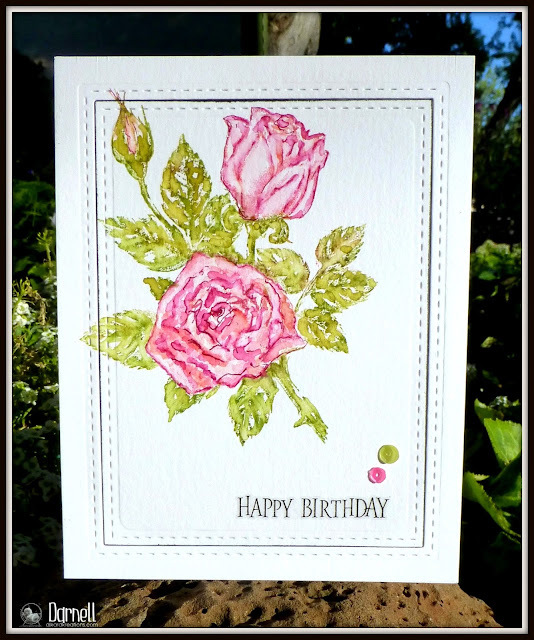 Gorgeous cards Darnell - you are on a watercolouring roll this week! There is the Flickr card [ I borrowed your idea ;)] -- love the fishing pole very cute idea. Gorgeous colored flower -- Fun day of participating hops huh? WOW!!! Both cards are absolutely marvelous and stunning!! Your watercolour cards are gorgeous, Darnell! Love the stamp on the first card - so fun! And the roses are stunning! Gorgeous watercoloring Darnell! Love how you created both a masculine and a feminine card! Oh my goodness...your martini card had me giggling out loud again...at work! Awesome card - awesome stencilling! Reminded me that I have some of these lattice pieces that I brought home from the Lakehouse! Love your inked background and the fish in the glass! Stunning, magnificent, beautiful, totally WOW flower card! Inking the edges of the inner panel makes an INCREDIBLE difference - GREAT idea! Yep, I'd be adding a stick-on too after all this work! Oh gosh ...too cute and gorgeous are these cards! Love the martini and I have to say my DH makes the absolutely best fresh squeezed lemon drop martinies ever! Your watercolor blooms are just gorgeous! WHat a fun image....love this card. Love your martini card! So fun with the handmade stencil. Great job Darnell. Two great cards. 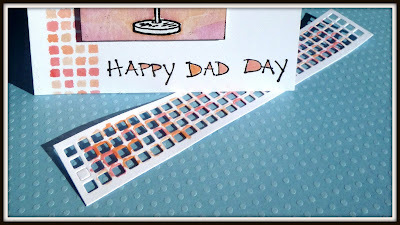 I like the stenciling on the Father's Day one. The drink there looks good enough to reach into the computer and take a sip. Beautiful coloring on the roses. I like that hint about accenting the edge. Both cards fab. I love the flower one. The roses look so real. great Mom and Pop cards!! What stunning cards!! LOVE the fun drink one. Could use a drink about now too!!! I like that you made a your own stencil. Great way to stretch your dies. The second one is STUNNING!!! I love that you used your distress markers and a very old stamp. The roses are so beautiful. GREAT take on all the challenges!! For me, the time for a drink is coming :-) Great card and cool watercolor. But the second card just stunned me! That is wonderful! These roses are a real impression. The moment you stopped by, transience and fragility ... a real miracle! Giiiiiiirrrlllll you need to break out those brushes more often because your watercoloring is out of this world! Stunningly tailored, extremely elegant and flabbergastingly lovely. That's all I can say about it. Darnell, beautiful watercoloring. I love the rose card. The martini card is so fun with the fish in the glass and the fishing pole on the side!! I love the dads day card and the beautiful rose one too. One as cute as can be and one so pretty! Love that first one and I really can't think of a better way to "go fishing"! I love the way you did the stencil and it has produced a wonderful result on your first card. Love the fishing rod in the glass - such fun! Great cards, Darnell. That martini is so funny and your roses are beautiful. I'm going to try to get something made to join in. Love to watercolor. Love both your cards but the flower one is awesome!!!! Fantastic cards, I love the Father's Day card! You are so funny! LOVE the description on your first card. I love the border you used. I am going to try that out!!! ....when the hills are pink....that's funny! Your second card is exquisite! You created the absolute PERFECT dad's day card for my dad. He loves fishing AND he's a wine-maker/liqueur maker. He would love this card! Now I wish I had these stamp sets. Thanks for the inspiration! Love the idea of cutting your own stencil! Beautiful watercolour cards! Have a great weekend! Dear Darnell, you have impressed me very much with your water colouring. Two amazing cards. I like the border on dad's card and fabulous colouring of the rose. So different but both so wunnerful. I'm really diggin the fishing rod in the martini glass for Dad. But the bestest is the filling station attendant's quote! Fun and fabulous cards. Love the fishing pole and fish and the border on the first and the roses are beautiful on the second. I like the watercolored stenciled border! Great way to stretch your die. And a fabulous color combo! Hi Darnell! I'm shamefully behind in commenting, and will come back to see your MASKerade cards soon. Meanwhile... I love the image on the first card! And I'm wondering if pink hills have pink elephants after the drink is drunk. The second card is a classic beauty. <3! Your first card is really fun, Darnell. Fishes inside a martini... could they be olive fishes? Your second card is just so beautiful, great job with watercolors. Clever idea to accent the borders of the inner panel. What a fantastic idea! I love that grid template technique! Looks AMAZING and so clever too! The fishing pole in the martini glass gave me a giggle!! Love this and your pretty watercolored panel. Your second card is beautiful, wow your roses look amazing!! So happy you could hop with us Darnell! Wow !! Both your cards are just fabulous ..hoe amazing is the grid design on your first card ! !..And I have totally fallen in love with your coloring on the second card ..so gorgeous !! Awesome cards Darnell - love the martini, and especially the reason for you background colours. The stencilled grid was an inspired touch. The roses are gorgeous!! Love how you have cut them out, blacked the edges and then re-inserted it in the frame. The rose card is divine. Love it. 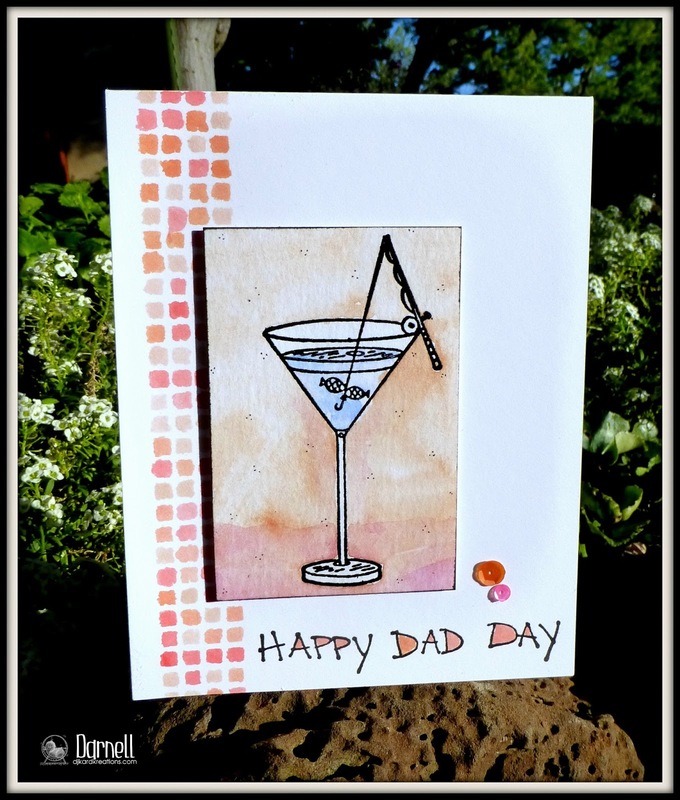 That's pretty cool martini glass stamp...a great fun image for a male card...and your rose is just gorgeous Darnell, beautifully water coloured. Both are great cards, very inspirational! Another brilliant post and gallery from you Darnell. I do love that fun image on the first one - very clever and superb watercolouring. It's addictive isn't it and so relaxing! Great to see you've linked up at AAA Cards and ATSM. Great cards, Darnell! I especially like the flowered one and how you added the dimension with the black around the edges - I have never done that but I like the look! 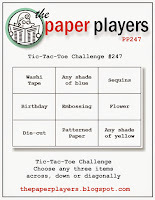 Congrats on your win at Paper Players!! Lovely cards, and the water coloring is so beautiful! Love the background, stencil, and gorgeous flowers! Beautiful cards again Darnell! Love the pink hills martini :))). I use the 5:00 rule, but there are several time zones in this country, right? Beautiful detailed roses...I need to look for a good rose stamp! Beautiful cards! Love the blocks and panel on your first! Enjoy the weekend! In my rush to comment on these beautiful cards I hadn't realised you had linked them to the ATSM challenge, so officially I wanted to thank you for playing!!! Sounds all serious, doesn't it?? Darnell, that rose card is so super beautiful! Great technique! Love it! Fantastic cards Darnell. Love the heat embossed martini glass with the wishing pole. That is just awesome... the border line with the little squares is amazing. The rose is beautiful. Wonderful colors. The watercolored grid is fabulous--gotta try that! 2 wonderful cards, Darnell, but the pink roses are my favorite--big surprise, huh?! Both cards are lovey but the flower is my favorite. That martini is a hoot with the fishing pole and fish! Maybe the bartender was drinking too. Your roses are so pretty and I love how you inked the black around the edges. Great idea to use the grid as a stencil. I would have sworn I commented yesterday, but I don't see it so if this is a second one, I'm nuts. Love how you made the panel down the side and the fishing rod in the Martini is a scream! Krasni voščilnici. Vrtnice so mi še posebej všeč, tudi voščilnica za očeta je lepa. 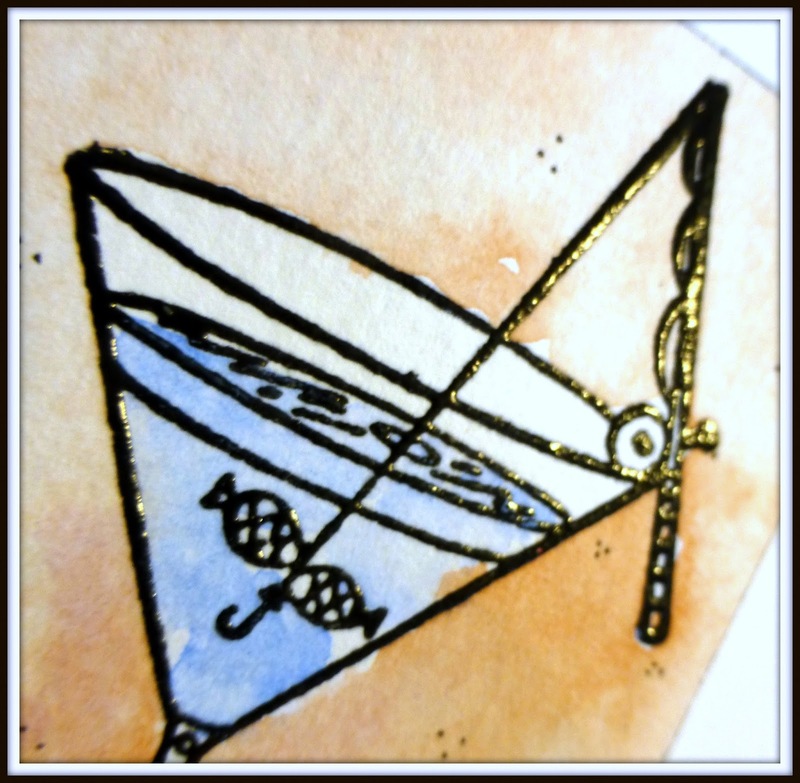 Both of your cards are fabulous...but I love that you are fishing for a martini! I know an easier way to get one but this is so clever and fun! There are pink hills somewhere at any given time. Right? Love the martini with fishes swimming happily! And your roses are gorgeous! OK you made me laugh with your drinking writing style:) The first card is fun and great for father's day especially with that saying. I love the roses-It looks like it was a watercolour painting which it is in many ways. June is my birthday month so this rose goes perfect! Oh...love that grid stenciled border! Now I'm thirsty. Your roses are gorgeous and so perfect in the throwdown colors! LOVE the stencil you made! It makes for a gorgeous stencil! Oh, why are there always 100 people here before me????? Love both of your cards, Darnell. Fantastic idea to use that border die as a stencil. It looks a bit like mosaic tile. And, your spritz watered flower is just beautiful. Two fabulous cards, Darnell! 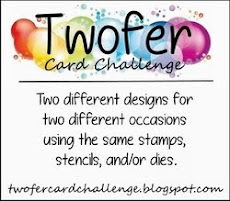 I love your water coloring and stenciling on the first one and your flowers on the 2nd card are gorgeous! You've really outdone yourself today! Thanks so much for playing along with us this week at ATSM...I alwaays enjoy seeing your creations in the gallery! Your watercoloring is fabulous! So clever to make and use your own stencil...must remember that tip...thanks for sharing. I'm cracking up over the fishing pole (and fish) in the martini glass! What a fun image, and I love your stenciled border too! Beautiful roses on the 2nd card, and the coloring looks ahhhhhhmazing!! Great cards! Your watercolouring on both cards is great, Darnell!!!! Love the cute martini glass and the roses are beautiful!!!! I'm so glad you joined in the Sweet 'n Sassy Stamps Let's Hear it for the Boys, Darnell. My dad loved to fish and had a wonderful sense of humor - he would have loved your card! Laughed so hre when I saw the 1st card I almost...er...we won't go into that here. Let's just say it is delightful and totally clever to use the die to create the stencil. The second one is 180 degrees out, feminine and elegant. Just bee-u-tea-full. What can I say that has not already been said!! You are a marvel and both these cards are absolute winners - so well done and those blooms are super spectacular!! Hugs and love to you!!! LOL! Sounds like the gas station attendant had quite the sense of humor! The flowers are just gorgeous! Here I am again!! Love these cards!, I think I have flunked the stamp on block...spritz thing...you aced it!! Awesome Darnell, the fishing pol in the martini glass? I forgot where I had let it--LOL Your flowers on the second card are beautiful! The martini card is fabulous. I really like the stenciling you did down the side and the watercoloring you did on the image. The roses are absolutely stunning. And the stitch dies add just enough interest without taking the focus away from the image. You're really getting into this watercolor thing, Darnell. 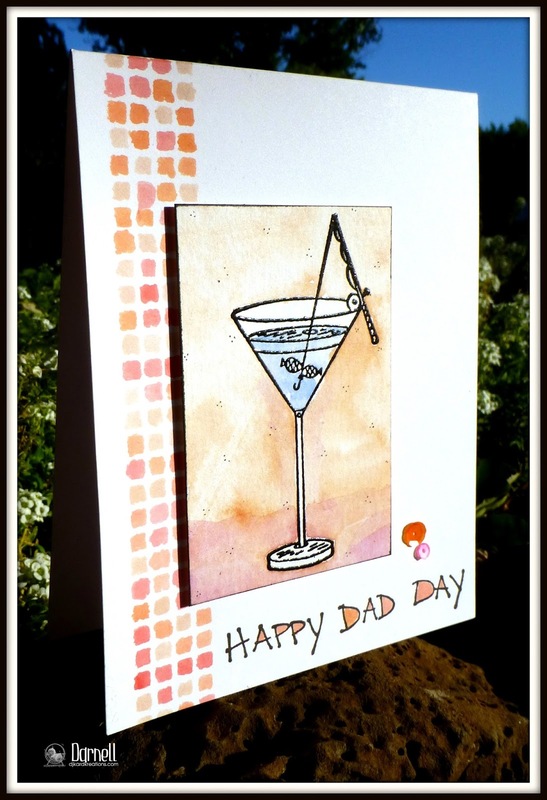 Your martini card is great and I love the watercolored grid. The roses? They are extraordinary! Super fun Dad's Day card and beautiful water-colored roses Birthday card. Thanks for playing at STAMPlorations! Hello my friend! TEN posts, and in the case of this one, 122 comments, behind! What the ??? I'm coming out from under the mountain of 'buried me under' stuff to do some catching up! Your martini card...brilliant! The teschure is amazing and I quite love the pink (and the 'when the hills are pink, it's time to drink' phrase, too). Your roses....swooning! Works of art! Are you counting down the days to your trip? We are...one. more. week!